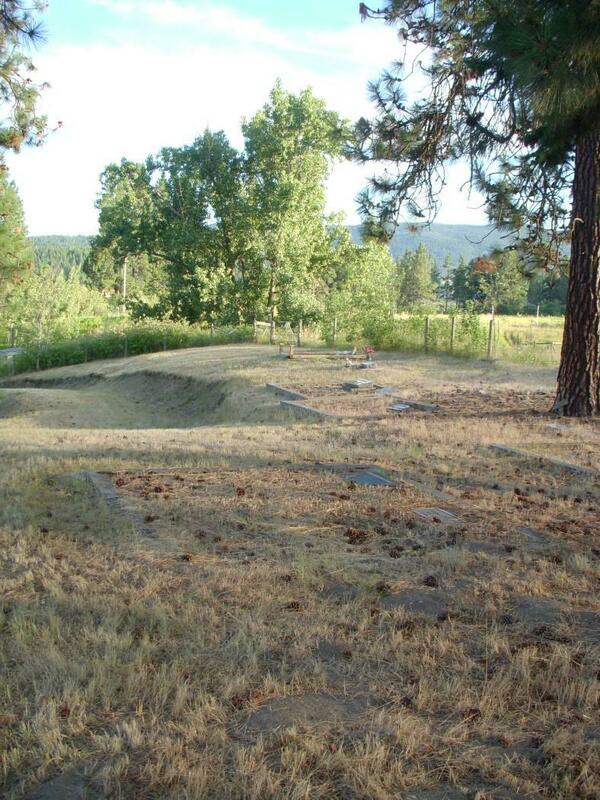 The following is a transcription of the Hullcar Cemetery located on Hullcar Road in Spallumcheen, British Columbia, Canada. 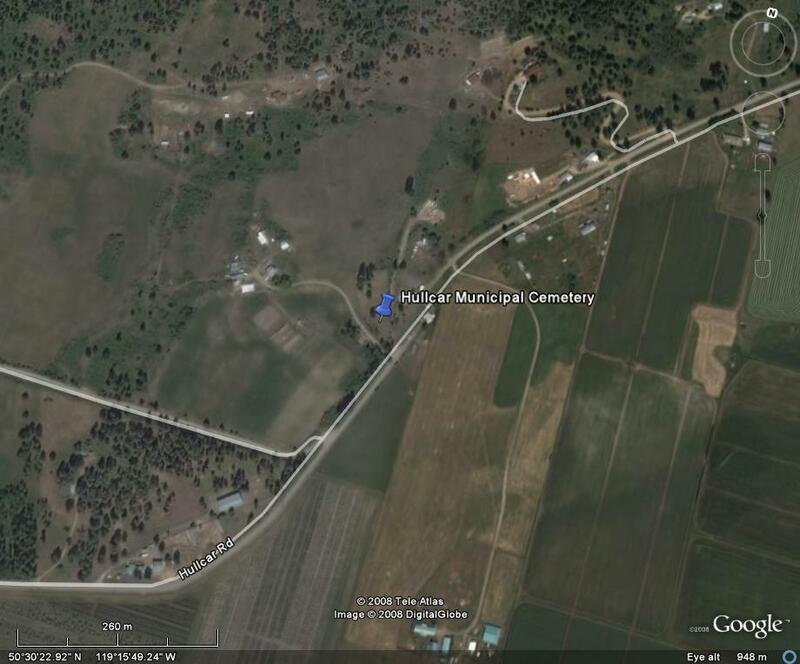 Latitude: 50o 30' 23.03" N.
Longitude: 119o 15' 50.88" W.
Hullcar Cemetery is a public cemetery in the Municipality of Spallumcheen. The Municipality takes care of the cemetery. The first burial was that of Charles Crane in 1899. At that time the land belonged to the sons of Mr. Crane namely John & David Crane. The burial was on the Crane's private property. Shortly after Mr. Crane's death, his daughter, Bessie Crane died. Bessie's fiance, Thomas Steele, also passed away. Bessie and Thomas were buried on the family farm as well. In 1904, a neighbour, Jane Parkinson, was buried in this spot, followed by a Crane grandson. Mrs. Crane was buried on the family farm in 1915. The Price family bought the Crane farm and donated the burial ground as a cemetery. The Hullcar cemetery is 1.31 acres in size. The legal land description is Part 1: 31 Ac Plan B 4813 Being Part N. Pt. SE 1/4 Sec 27 TWP 34 C.G.3759. The grass is regularly cut by Spallumcheen Municipality; however there is an area that is deeply covered in pine needles and cones, which are causing the stones to deteriorate and become difficult to read. The Hullcar Cemetery is fenced with barbed wire, with the exception of the front, which is page wire and rail. There are upright markers and flat markers, made with marble, concrete and a few of metal. In recent years family members have replaced some of the old markers. There are two family plots which are fenced with ornate green railings. One is the Parkinson family plot, in which there are headstones. The other is the Crane family plot, where the graves can easily be seen because they are mounded up, but there are no markers. There is a plaque on the gate which simply says "Crane". Go west to Okanagan Street, turn north (right) for one block to Wood Avenue, turn west (left). Continue on Wood Avenue, which becomes Salmon River Road – stay on this road for 6.5 km. You are now at a main intersection – continue straight, the road is now called Knob Hill Road, stay on this for 3.5 km. – another main intersection [you’ll see Hullcar Hall on your right] – turn west (left) onto Hullcar Road. Follow Hullcar Road for 2.8 km. The cemetery entrance is on your right, a bit hidden by bushes. It has a frontage of only 20 feet at the road and there are driveways on either side. The cemetery is triangular, extending back from the point at the road and widening out. 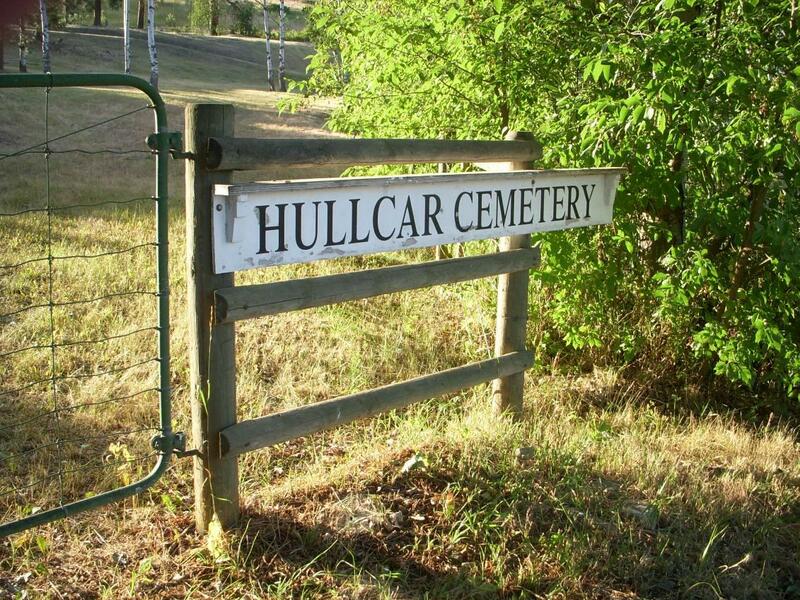 There is a sign at the gate, "HULLCAR CEMETERY".